David Norris listens to a question at the official launch of his campaign this morning. DAVIS NORRIS has confirmed that he received a disability pension for almost 16 years – explaining that the allowance, paid by Trinity College, was in respect of a Hepatitis diagnosis the Senator was given while abroad. 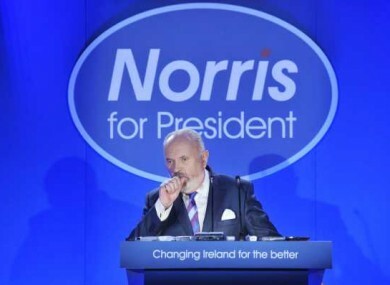 Launching his campaign officially this morning, Norris addressed reports carried in this morning’s Irish Independent, when it was reported that he had received an allowance from Trinity – while a full-time member of the Seanad. Norris told reporters he had contracted the illness in 1994 while travelling in central Europe, as a result of ingesting unsafe drinking water. He was unable to return to his academic duties as a result, and had been advised by Trinity College – where he was still on the payroll, though he had been in the Seanad for five years before that – to apply for “permanent disability”. He was therefore replaced by another member of staff and had been put on a disability pension by the college. Norris stressed that he had not claimed a state allowance for his condition, which he described as “non-A, non-B, non-C”. Norris also read a prepared statement on his outstanding letters seeking clemency for his former partner Ezra Nawi, explaining Israeli legal advice which said that the Israeli courts would have to approve the publication of the letters before they could be released. He said that the letters which had already been released had been done on the basis of qualified privilege, but that this qualified privilege would be lost on a worldwide basis if other letters were released. Norris also said that in the modern era, the letters could easily circulate around the world, which could cause anguish for Nawi and his victim. The Senator also named the parties who had offered him legal advice in that regard, in both Ireland and Israel. In Ireland, he had been advised by Michael O’Higgins SC; in Israel, he had been advised by a firm based in Haifa. Norris refused to state, however, when their advice had been sought. In earlier remarks, Norris has described Ireland as an “empty shell, like the unfinished Anglo headquarters a mile or so from here”. “The Ireland of the bright baubles has sadly passed away,” he said, adding that the forthcoming election was “a referendum as much as an election, a chance for the people of this wonderful country to change. “No independent candidate has ever won a Presidential election. A vote for me is a vote to change Ireland for the better,” he said. Email “Norris received TCD disability pension because of Hepatitis diagnosis”. Feedback on “Norris received TCD disability pension because of Hepatitis diagnosis”.